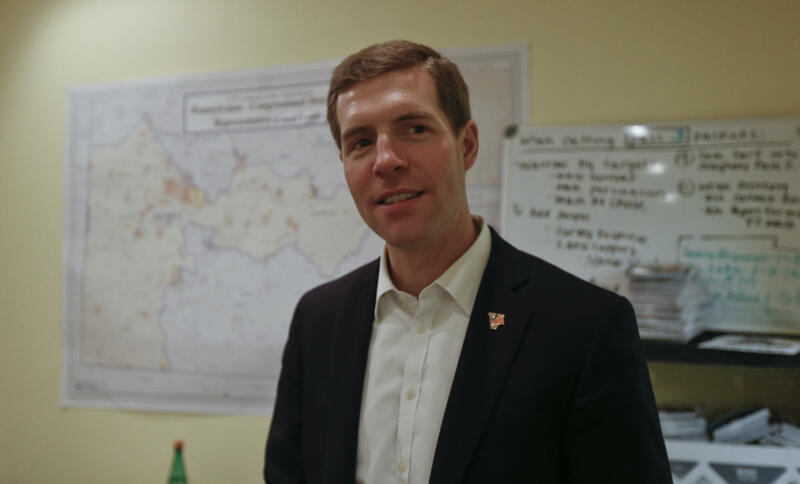 The Democratic candidate for Pennsylvania's 18th Congressional District, Conor Lamb, is leading 51 percent to 45 percent against his Republican opponent Rick Saccone in a Monmouth University poll released Monday. Voters in the district's special election will cast their ballot Tuesday to fill the open House seat to Rep. Tim Murphy's replacement after his resignation in October. Monmouth's findings in Lamb's favor are based in a voter turnout model that mimics the Democratic surge seen in other special elections over the past year. It also found that a historical midterm election model as well as a model forecasting higher voter turnout yielded the same result, putting Lamb in the lead, although by smaller margins. Just one month ago, all three models of the Monmouth poll gave Saccone the advantage against his Democratic opponent. Overall, likely voters polled in Pennsylvania 18 have a 53 percent positive, 33 percent unfavorable view of Lamb and a more divided take on Saccone (47 percent percent favorable to 43 percent unfavorable). Both candidates poll extremely well with voters who identify with their respective parties. Independents tend to favor Lamb by a 51 percent to 45 percent margin. While President Trump's recently imposed tariffs -- 25 percent on steel and 10 percent on aluminum -- have prompted a negative reaction from both Democratic and Republican lawmakers, very few voters polled said the decision would affect their vote. According to the poll, voters in the Pennsylvania district are divided on whether the steel and aluminum tariffs will boost or bust the local economy. The Monmouth University Poll was conducted by telephone from March 8 to 11, 2018 with 503 registered voters in Pennsylvania's 18th Congressional District. Results in this release are based on the responses of 372 likely voters for Tuesday's special election and have a margin of error of +/- 5.1 percent. The poll was conducted by the Monmouth University Polling Institute in West Long Branch, NJ.